asymco | Apple’s R&D Efficiency. Following up on R&D efficiency, we are measuring operational expenses for Apple. 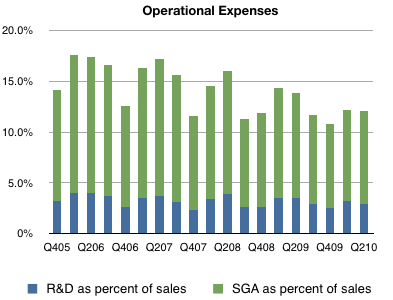 Here is the chart showing how, as a percent of sales, R&D + SG&A have declined, though R&D has been more resilient holding fairly steady at 3 percent and SG&A dropping from about 11% to approximately 9%.